Interested in competing? Take a look at the different competitions we will be hosting this year! This Harvest Moon Ball-style contest is open to anyone! Dancers register as couples and will dance to music selected by ILHC. This is a no-holds barred competition. All lifts, drops, aerials, airsteps and acrobatics are allowed. Judges will be looking for great dancing spontaneity, creativity and connection to the music. WINNER TAKE ALL Cash prize of $2000. Trophy to 2nd-5th place. Social Dance Competitions. Leaders and followers will be randomly drawn to dance together to several songs of varying styles and tempos, but will be judged as individuals in the preliminary rounds. Dancers selected to dance in the finals will be randomly assigned a partner again, but will be judged as a couple as they dance in a spotlight format. NEW THIS YEAR…NO FEE TO COMPETE!!! Classic Lindy Hop categories will have an additional level (All-Star) this year! Showcase divisions change this year, becoming a high-flying, no-holds barred competitions: The Showcase Throwdown, open to anyone with a grand prize of $1500! 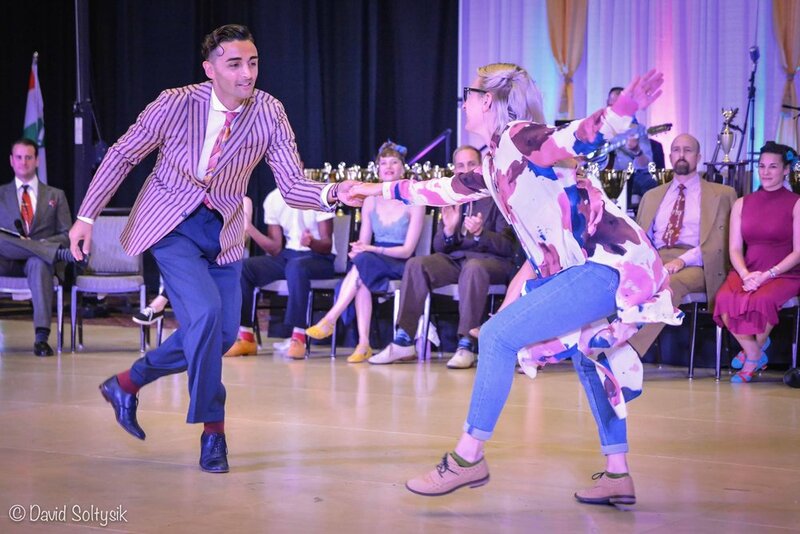 Lindy Hop Pro-Am and Team competitions return as normal. Dancers register as couples and will dance to music selected by ILHC. The finals will be danced in a jam format to a live band. Judges will be looking for spontaneity, creativity and connection to the music. New Invitational Strictly Slow Swing! This is a solo American vernacular jazz dance contest. Dancers must include Charleston variations and may also include black bottom and vernacular jazz movements. NEW Format for Invitational this year! The highlight of the weekend is always the Juniors competition. This year we are adding a new Juniors Solo division!